The challenge of New Zealand’s unique South Island fishery is ‘infamous’ and its complexities have been compounded in recent times as our popularity as a fishing destination continues to grow. Compared to many fisheries around the world, trout fishing in New Zealand is quite difficult. Trout here have never been exceptionally plentiful (we don’t measure them in 1000s of fish per mile), and are very rarely easy to catch. You need to be ‘on your game’! 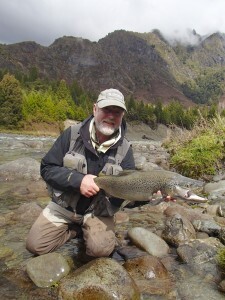 NZ fly fishing can be tough, even for experienced anglers. As our trout are pursued by increasing numbers of anglers, both visiting and local, it can be a very humbling fishery. Those who choose to fish by themselves and those whose skill level is not up to the mark, will find the challenge ‘confronting’ to say the least. In New Zealand, trout fishing is seldom a numbers game and our biggest trout are not fooled easily … you learn the ropes, refine your skills and ‘go often’ to the water. The surest way to ‘level the odds’ as a visiting angler is to hire a professional guide, as so often the key to consistent success rests in your guide’s ability to spot and stalk the trout and assist with the best flies and techniques to catch them. There is however much more to your enjoyment of the New Zealand fishery than simply finding and catching fish. Your guide should be a good companion, a patient teacher and have sufficient experience of the weather, safe river crossing and travel in the New Zealand back-country to ensure your personal safety and well being. However, there is no doubt that the more you fish here the greater the personal satisfaction you develop as an angler, the greater the joy there is in fishing stunningly beautiful rivers … and the greater the rewards in the quality of fish landed. For many anglers who ‘get it in perspective’, fly fishing for New Zealand trout quickly becomes a life-long addiction. You can fish with me on local river trips, daily helicopter fly-outs or remote overnight back-country helicopter or hike-in camp-outs. Fishing is mostly with dry flies or small weighted nymphs and you can expect to catch trout averaging 3.5lb (1.6kg), with the prospect of an occasional trophy trout weighing 10lb (4.6kg) or more. I’ve made some important changes to the guiding options I offer to visiting anglers. … extended road trips away from my home base of Richmond (Nelson). … overnight camp-out trips greater than one night/two days duration. … the option to pre-book single guide days further in advance than 5 days of the requested date. (However: if you do want these types of fishing I am happy to refer you onto to other guide friends who specialise in these experiences). NB: For anglers based in St. Arnaud or Murchison who would like to fish with me on day trips, I am very willing to meet up with you at a mutually agreed location. The New Zealand trout fishery originally became famous for the regularity that anglers could catch trout averaging around 4 lbs … which is a big trout for most anglers. On any trip an angler could also expect to be presented with the opportunity to catch some trout bigger than that … however fish over 8lb are not as common as some visitors may believe. The legends of giant trout in so called ‘Year’s of the Mouse’, stir the blood of any hot-blooded angler, but are now regularly overstated. Certainly, in years when rodent populations increase dramatically we do see a corresponding increase in the number of trophy trout … but they are not the norm and are to be treasured when they occur. 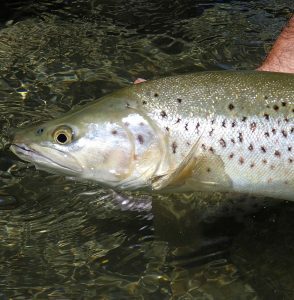 Large trout over 8lb are definitely out there and could be landed on any day, from nearly any stream we fish (in this part of New Zealand anyway) … but they are less common than some would have you believe and are definitely ‘special fish’. If you specifically want to chase trophy trout you should talk things through with me before you arrive. While anglers who have fished with me have landed more than 120 ‘double digit’ trout now over the years … big trout don’t come easy. I can do my best to help you, but you need to be realistic about your casting abilities, your experience with landing larger-than-average trout (5+ lb) … and your physical ability to move around some of our roughest waters. We lose many more trophy trout than we land. Before getting fixated on catching only big trout, you should understand that ‘chasing trophy trout’ generally means we will miss opportunities to fish on other more productive waters which still produce quality, but smaller trout … big fish and lots of fish seldom go together. One way or another, my life has always been substantially linked to the world of rivers, trout and fly fishing. I first started trout fishing with a worm as a seven year old and it wasn’t long before I was seduced by the pleasures of fly fishing … I have held a licence every year since. 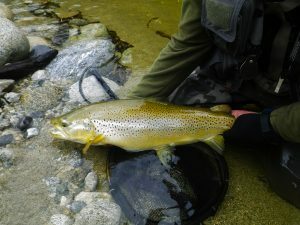 By my early twenties I was teaching others the skills of fly fishing and have now taught hundreds of anglers how to cast a fly and enjoy the amazing trout fisheries in the northern South Island. The complete experience of fly fishing for trout, the magnificent surroundings in which we indulge our passion for the sport and the wonderful people I have met as a consequence, remain very much the central pivot of my life … my reason for being. I’ve been guiding full-time now since 1980, which gives me an in-depth knowledge of the best fishing opportunities around the upper South Island. After a brief stint as a secondary school teacher I started my first guiding business in 1980, based at St. Arnaud in Nelson Lakes National Park. I helped pioneer heli-fishing into many of the magic wilderness streams that characterise the northern area of the South Island. Now they have become established names in international angling circles. 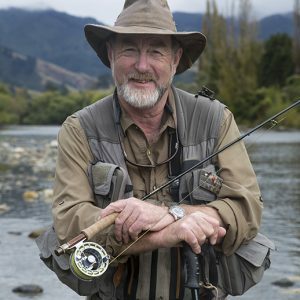 I am a Life Member and former President of the New Zealand Professional Fishing Guides Association and was a founder member of the NZ Fly Fishing Team to several World Championships from 1987-1992. From 1990-1999, my wife Sharon and I owned a specialist fly-shop and shooting store in Nelson. For seven years I was a councillor on the Nelson Acclimatisation Society and then the Nelson-Marlborough Fish and Game Council. 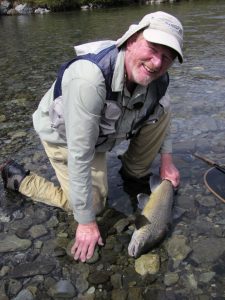 I have actively lobbied for the protection of New Zealand’s sports fisheries for most of my adult life and have been a regular contributor of articles on fly fishing in New Zealand for more than thirty years. When you join me in pursuit of some of the world’s finest brown trout, my commitment is to provide you with a memorable angling experience that will improve your chances of success and help lift your angling skills to a new level. The ongoing success of my clients is a source of great satisfaction for me. Thank you very much for giving Peter and I such memorable and remarkable days of fishing in your beautiful country. We thoroughly enjoyed your outstanding guiding skills, which brought us exactly what we were hoping to find in NZ, namely the sighting and catching of big brown trout on the dry fly and nymph as well as tapping into your impressive knowledge of the surroundings … We will be recommending our friends to make the journey and to contact you and hope some of them take up the idea, and maybe we will also return to the true garden of the big brown. I remember those fun-filled days clearly, and my arms still ache slightly. Our trip was a great success, and I want to thank you for making it happen. We enjoyed a lot of splendid experiences this time because of you. Thank you. Thanks for a great few days. It was good to catch up with you, I always enjoy your company. The fishing was tough but that was good for me, I was getting a bit cocky. We did get a couple of trophy fish and watching you fish that big one over the current on the last day was a once-in-a-lifetime experience. I just wanted to send a thank you for your help in getting my trip to NZ off to a great start. Throughout my trip I worked on remembering the things we talked about and found them to be really helpful. The combination of these tips helped me catch some really great fish and I just wanted to say thanks and let you know that we were listening intently! Many thanks for your company and direction for the 3 days. Mike is stoked and it’s given me satisfaction that he has now had a complete NZ experience. After my own debriefing, I can tell you now to what extent I was lucky to have benefited from your services in New Zealand. Not only are you a very professional guide, but your global knowledge and motivation were also for me a strong enriching experience. You really turned on a memorable day for our visiting friends from Cornwall the other day. We had a wonderful time fishing with you and are most grateful for all the technical advice that you gave us. The new handgrip improved Nancy’s casting and your technique for casting into the wind was invaluable throughout the rest of the trip. I was impressed with your knowledge of the rivers. You are one of the best guides I have fished with in New Zealand. The fishing has left me lots to ponder… it is certainly unique. The most important lesson learned was the need for a knowledgeable guide. You gave us more than we dared hope for … It was the highlight of my three weeks in New Zealand. The highlight of my stay was having Tony Entwistle as my guide … I have enjoyed the service of some outstanding guides in California and Alaska, but Tony is something special. His ability to spot fish is incredible. Thanks for a great four days on the South Island. That’s the best fishing I’ve ever seen and you sure know where they are. Thanks very much for a great day of fishing … You contributed greatly to the thrill and enjoyment of my first trip to New Zealand.